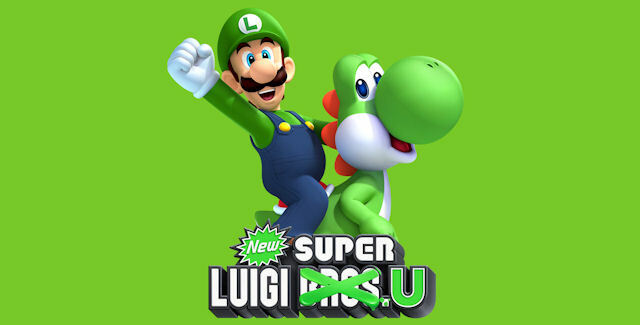 Available in both downloadable form (as of June) and now retail form (as of late this month), New Super Luigi U gives everyone's favorite green-clothed plumber some more time in the spotlight. What's that, Mario? You getting jealous? Why, you're turning so green with envy, you're starting to look like your brother! Anyway, here's SuperPhillip Central's review of New Super Luigi U. When the Wii U was released back in November of last year, New Super Mario Bros. U was a heavily popular launch title among purchases. Nintendo had promised some form of downloadable content in the near future. Well, the near future is upon us, and instead of creating packs of three levels like New Super Mario Bros. 2 on the Nintendo 3DS, Nintendo has created what is essentially a brand-new game. With Mario out of the picture, Luigi is the star of his own platforming adventure, New Super Luigi U. (It is the Year of Luigi, after all!) 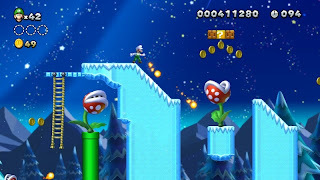 While folks with a copy of New Super Mario Bros. U could download the game for twenty dollars in June, the retail version of the game was released this past week-- one that could be purchased for New Super Mario Bros. U-less Wii U owners or collectors like myself. 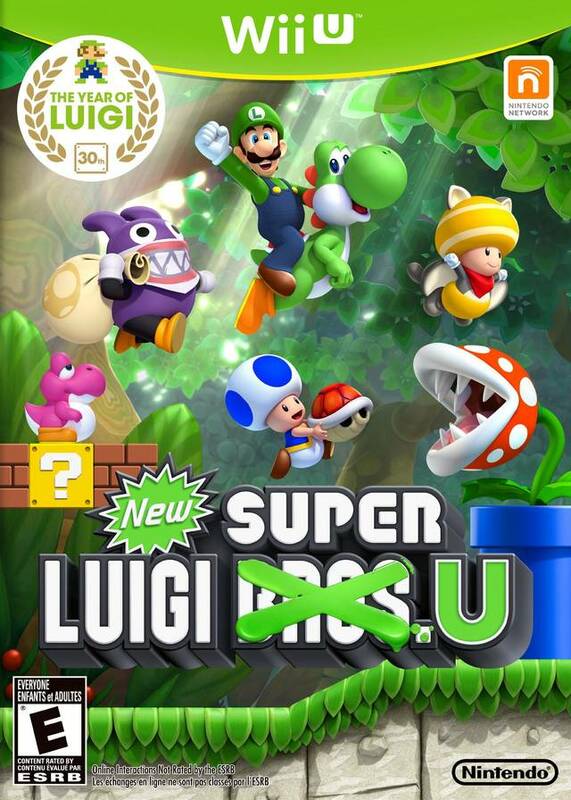 Does New Super Luigi U add enough content to justify its price tag? In a word, yes. 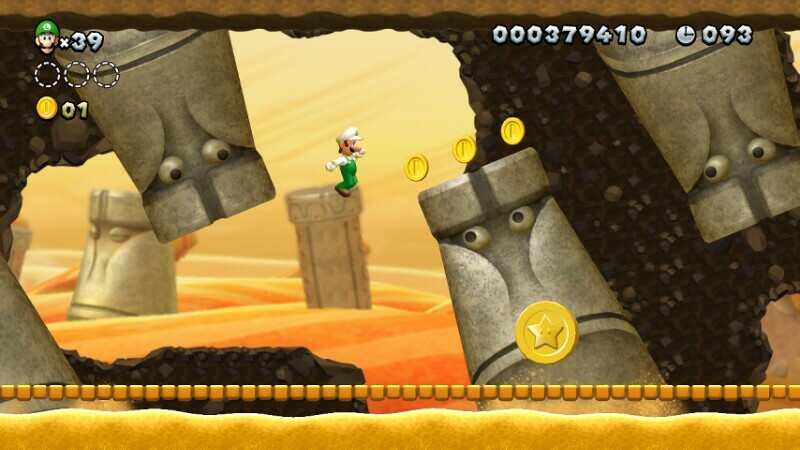 New Super Luigi U has the exact same plot of New Super Mario Bros. U, and a similar opening cinematic. The only difference is that Mario is nowhere in sight, so it's Luigi's turn to save the princess from the fearsome Bowser, who has taken over Peach's castle. There's one more similarity, and that's the world map. Everything remains unchanged on that front. Super Mario Bros.-- the Hammer Brother. 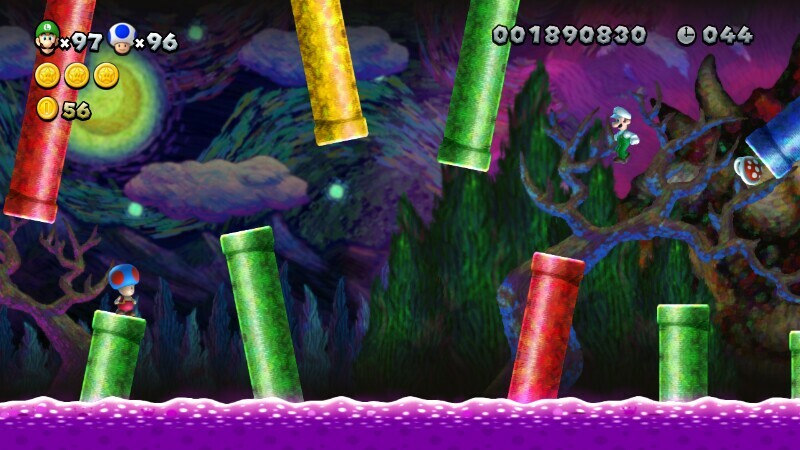 New Super Luigi U isn't downloadable content that simply rearranges levels. No, the developers have crafted incredibly made new levels to test players' skills. 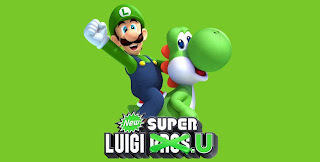 If you thought New Super Mario Bros. U was too easy of a game, New Super Luigi U's first world is about as challenging as New Super Mario Bros. U's fourth world, and it only gets crazier from there. By the ninth world, you will be running through 1-ups like toilet paper to a man with diarrhea. Sorry for the mental picture. Every level in the game gives you only 100 seconds to work with, meaning you don't have much time to dilly-dally around. 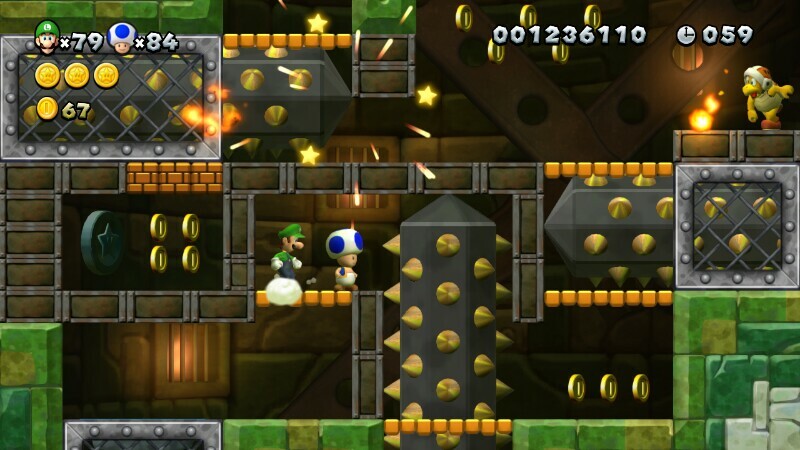 That said, the levels are much briefer affairs than New Super Mario Bros. U's. That's a good thing, too. Levels in New Super Luigi U have zero checkpoints, much more fiendish star coin locations, hard secret exit spots (all secret exits are located in the same levels as in NSMBU) and a level of challenge that 2D Mario fans haven't seen since the Japanese version of Super Mario Bros. 2. The risk of death is much greater, and the fast levels make having to replay them much less of a hassle. It's also terrific for playing in short bursts. taste of their own medicine. A part of the challenge is how Luigi, his two Toad counterparts and the all-new playable character Nabbit (more on him later) control compared to their New Super Mario Bros. U counterparts. They can jump much higher and get extra hang time in the air. 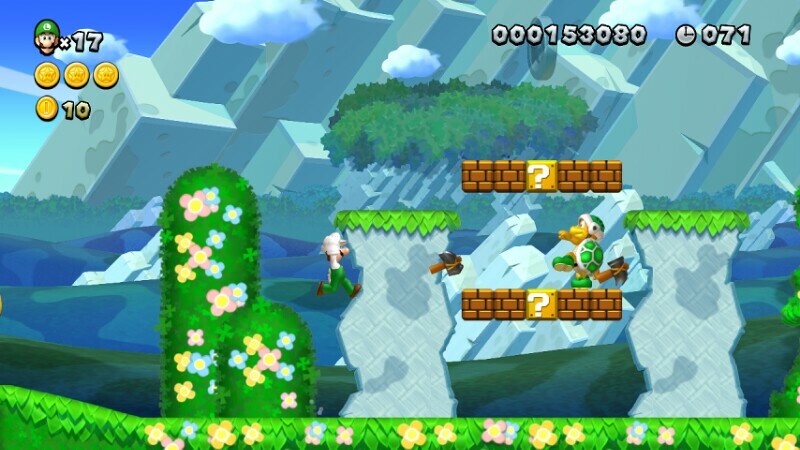 However, each character's momentum will have them putting on the brakes noticeably slower than NSMBU's physics. This can make those death-defying leaps all the more intense. Luigi's just showing off now. Another aspect of challenge concerns multiplayer. 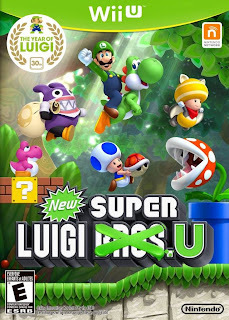 New Super Luigi U wasn't really built for four players. There's far too many thin platforms and jumps that require pixel perfect (or is it polygon perfect?) precision. This can be hard (and quite frustrating) to have a group try to make jumps only to have someone jump off another player's head and bounce into the abyss, or push another player into the lava. Even with two players the game can have some truly tricky spots. Still, players are able to freely enter a bubble at any time to stay out of the way of harm, but this can be abused to make New Super Luigi U easier than intended. Don't disgrace yourself and your friends by doing this. If there is no dignity, then there is no honor-- or something like that. work with here for four players. New Super Luigi U is a devious game in difficulty, so some might be curious as to whether or not the game would be suitable for younger children and family members to play. This is where the fourth playable character comes in, Nabbit. Nabbit is unlike Luigi, Yellow Toad and Blue Toad. He can only lose a life by being crushed, falling down a pit, or touching lava or poisoned water. He can run through enemies without taking damage. Nabbit cannot pick up objects or use items. He simply grabs them and puts them in his burlap sack. How ever many he nabs will grant him several 1-ups at the end of a given level. want us in this tower. 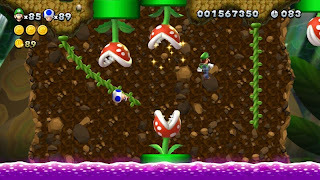 New Super Luigi U delivers something that a lot of Mario fans have been desiring for a long time-- a 2D Mario platformer that is tough to beat. Technically, this isn't a 2D Mario game, but a 2D Luigi game, so theoretically Mario fans are still waiting. In all seriousness, New Super Luigi U is a great game to play in small sessions, but also nice for long playing periods. You can make a hefty amount of progress in a few short hours. The levels are magnificently designed, the level of challenge is high but fair, and the option to play as Nabbit allows a type of accessibility so all can enjoy this downloadable content turned retail package. As the tagline of this review reads, "It ain't easy being green, but it sure is fun."